This article is about the book. For the episode, see The Haunted Mask (Goosebumps episode). 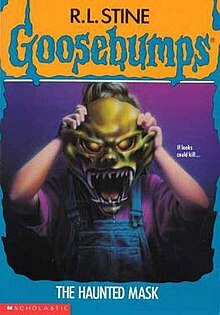 The Haunted Mask is the eleventh book in Goosebumps, the series of children's horror fiction novels created and written by R. L. Stine. The book follows Carly Beth, a girl who buys a Halloween mask from a store. After putting on the mask, she starts acting differently and discovers that the mask has become her face; she is unable to pull the mask off. R. L. Stine says he got the idea for the book from his son who had put on a Halloween mask he had trouble getting off. The Haunted Mask was featured on the USA Today and Publishers Weekly bestseller list, and cited by one reviewer as "ideal for reluctant readers and Halloween-themed sleepovers." In the mid-1990s, the book was adapted for television and released on VHS on March 12, 1996. The Haunted Mask has three published sequels: The Haunted Mask II, The Scream of the Haunted Mask and a stand-alone story, Wanted: The Haunted Mask. The Haunted Mask was written by R. L. Stine and originally illustrated by Tim Jacobus. The author says the idea for the book came from his son Matthew Stine, who put on a mask that he had trouble getting off during Halloween. Stine also says that he incorporated a duck costume his parents got him for trick-or-treating in the book. Tim Jacobus's niece was the model for the cover of the book. The book was first published in September 1993 by Scholastic, and reissued in 2003 and on September 1, 2008. An audiobook, narrated by Jorjeana Marie, was published in 2015 by Scholastic Audio. Carly Beth Caldwell is a naive, timid and gullible 11-year-old girl who is afraid of pretty much everything. Thus, she is a constant target for pranks, jokes and tricks, most of them being inflicted on her by Steve Boswell and Chuck Greene at Walnut Avenue Middle School. In the opening chapter, Carly Beth and Sabrina discuss what costumes they are going to wear for Halloween, and Carly Beth is tricked by Steve into eating a sandwich containing a live worm. Horrified, Carly Beth flees and vows revenge. After school, she goes home and finds her mother has made her a silly duck costume for Halloween, and also a very realistic plaster of Paris model of Carly Beth's head. When she goes to her room, the duck costume seemingly comes alive and attacks Carly Beth. It turns out it is her younger brother, Noah, playing another trick on her. Sabrina calls, and they discuss the school science fair. At the science fair, Steve causes a panic by announcing his pet tarantula has escaped, and Carly Beth is terrified of tarantulas. Steve creeps up behind her during the chaos, and pinches her leg to make it seem that the tarantula is biting her. Carly Beth flies into a frenzied panic, destroys her and Sabrina's project and is again humiliated in front of her teachers and classmates. Carly Beth vows that she will definitely make Steve pay for what he did to her. She plots to go to a new store that has opened, which sells frightening costumes, and plans to scare Steve and Chuck as payback. On Halloween day, she goes to the party store, but it is closed. However, the store manager appears and allows her into the shop. She dismisses the masks she sees on display as not good enough for scaring anyone. But she sneaks into a back room and discovers a row of hideously deformed masks. She is startled to find that the masks feel warm and like human skin, not rubber or plastic. The store owner reluctantly sells her one of the masks and Carly Beth goes home in delight. Later that day, after she takes the mold of her head that her mother made, she puts on the mask and goes in search of Chuck and Steve, determined to get revenge on them. She starts acting more and more aggressively as the night goes on: she chokes Sabrina, throws apples at a house, and frightens children she does not know. When she manages to scare Chuck and Steve, she loses the head her mother made, but no longer cares. While at Sabrina's house, Carly Beth is shocked to find she is unable to remove the mask and that the mask has, in fact, become her face. She returns to the store and finds the owner waiting for her. The store owner tells her that the "mask" is actually a real living face. All the masks in the back room are deformed, monstrous, living faces. The store owner made them, but they started out beautiful but then became hideous. Every so often, a person puts one on and the mask possesses them. It can only be removed by a "symbol of love", but if it attaches itself to her or another person again, it will be forever. Carly Beth screams in horror, and the other masks begin to pursue her. While running away from the masks, she realizes that the mold her mother made is a symbol of love. Carly Beth finds the mold and uses it to deter the masks and remove the mask from her face. She returns home to her mother, tossing the mask away. Noah later bursts in and asks her, "How do I look in your mask?" The Haunted Mask was featured on USA Today's Top 150 Best-Selling Books database for 43 weeks, attaining a peak position of 107. In 2001, it was listed as the 249th bestselling children's paperback book of all time by Publishers Weekly, having sold 1.42 million copies. Terreece Clarke from Common Sense Media rated the book three stars out of five, commenting that it "is ideal for reluctant readers and Halloween-themed sleepovers" and "is one of the better books in the Goosebumps series". Flavorwire's Kevin Pires listed the book as one of his ten favorite Goosebumps books, stating "Tim Jacobus’ [...] gripping illustration and Stine’s straightforward plot made The Haunted Mask an emblem for the series." Nathan Reese and Brooke Marine from Complex.com ranked it as the best Goosebumps book, stating the book was very thrilling, and the twist ending caused the right amount of horror. Writer and librarian Herbert N. Foerstel stated it was "perhaps the most famous Goosebumps book". Filming for "The Haunted Mask" episode began in 1995 in Toronto, Ontario, Canada. The episode first aired on October 27, 1995 on the Fox Network as the series premiere of the Goosebumps TV series. In the United States, "The Haunted Mask" was viewed by 14.1 million people. In Canada, the episode aired on YTV and became the network's highest rated episode up to that point, with nearly three million viewers. It was subsequently released on VHS on March 12, 1996. The video was listed 75th in Billboard's list of Top Video Sales for 1996, the only Goosebumps video on the list. Frazier Tharpe, Brendan Klinkenberg, and Khal from Complex.com named it the 10th best Halloween themed TV episode and called it one of the scariest Goosebumps episodes. Michelle Erica Green from FamilyWonder.com viewed it less positively, stating that it had stereotypical characters, a corny feel-good message, and hokey special effects. In 1997, Kathryn Long, who played Carly Beth, received a Gemini Award nomination for "Best Performance in a Children’s or Youth Program or Series". Three sequels of the book were published, The Haunted Mask II in October 1995 (the thirty-sixth book in the Goosebumps series), The Scream of the Haunted Mask on August 1, 2008 (the fourth book in the Goosebumps HorrorLand series) and a stand-alone story on July 1, 2012, Wanted: The Haunted Mask. Wanted: The Haunted Mask was published as a celebration of the 20th anniversary of Goosebumps. Another book, The Haunted Mask Lives!, was listed on illustrator Tim Jacobus's website, but was not released. ^ "13 Things You Want to Know About R.L. Stine". Scholastic. Retrieved May 4, 2018. ^ Neary, Lynn (October 31, 2008). "Goosebumps And Guffaws In Stine's 'HorrorLand'". NPR. Retrieved February 7, 2015. ^ Jacobus, Tim (February 1998). It Came from New Jersey! : My Life as an Artist. Scholastic. p. 29. ISBN 0-590-10853-0. ^ Lodge, Sally (July 21, 2003). "Children's Books for Fall, Sasquatch Books - Silver Dolphin". Publishers Weekly. Retrieved May 20, 2017. ^ a b Clarke, Terreece. "Classic Goosebumps: The Haunted Mask". Common Sense Media. Retrieved February 7, 2015. ^ "The Haunted Mask". OverDrive. Retrieved July 3, 2017. ^ "The Haunted Mask". USA Today. Retrieved May 20, 2017. ^ Hochman Turvey, Debbie (December 17, 2001). Roback, Diane; Britton, Jason, eds. "All-Time Bestselling Children's Books". Publishers Weekly. Retrieved May 4, 2018. ^ Pires, Kevin (October 8, 2013). "Celebrate R.L. Stine's 70th Birthday With His 10 Best 'Goosebumps' Books". Flavorwire. Retrieved February 7, 2015. ^ Reese, Nathan; Marine, Brooke (October 27, 2014). "The Definitive Ranking of All 62 Original "Goosebumps" Books". Complex.com. Retrieved May 4, 2018. ^ Foerstel, Herbert N. Banned in the U.S.A.: A Reference Guide to Book Censorship in Schools and Public Libraries. Greenwood Publishing Group. p. 222. ISBN 0-313-31166-8. ^ Gittins, Susan (September 1996). "Bronfman in prime time". Report on Business Magazine. 13 (3): 86–92 – via ProQuest. ^ Martin, John (October 27, 1995). "Things that go 'Goosebumps' in the night". The Gadsden Times. p. D4. Retrieved February 7, 2015. ^ "Nielsen ratings" (PDF). USA Today. Retrieved January 31, 2015. ^ McKay, John (January 26, 1996). "Slime TV Kids horror series gives them Goosebumps". The Canadian Press. Winnipeg Free Press. p. D1 – via Factiva. ^ Heffley, Lynne (March 22, 1996). "Youthful Performers Get 'Lesson' in Drama". Los Angeles Times. Retrieved February 7, 2015. ^ "Top Video Sales". Billboard. 109 (2): 39. 11 January 1997. ISSN 0006-2510. ^ Tharpe, Frazier; Klinkenberg, Brendan; Khal (October 27, 2017). "The 25 Best Halloween Themed TV Episodes". Complex.com. Retrieved May 4, 2018. ^ Erica Green, Michelle. "Goosebumps - The Haunted Mask". FamilyWonder.com. Archived from the original on June 16, 2000. Retrieved February 7, 2015. ^ "Gemini Nominees: And the 1997 nominees are". Playback. January 27, 1997. Retrieved February 7, 2015. ^ "The Haunted Mask II". RLStine.com. Retrieved May 20, 2017. ^ Shannon, Terry Miller. "Goosebumps Horrorland: #4: The Scream of the Haunted Mask". Kidsreads.com. Retrieved May 4, 2018. ^ "Wanted: The Haunted Mask". Kirkus Reviews. Retrieved May 20, 2017. ^ Stine, R. L. "New Haunted Mask Novel!". RLStine.com. Archived from the original on December 20, 2016. Retrieved May 20, 2017. ^ "GooseBumps Gold". TimJacobus.com. Archived from the original on October 2, 2017. Retrieved May 4, 2018. This page was last edited on 8 April 2019, at 15:36 (UTC).